I’ve given this product a pretty through going-over now, and I can categorically say that I love it. I say ‘product’, but really it’s ‘products’ plural, because the Amazing Face Cleansing System consists of a cleansing balm, a tub of exfoliating rosehip seeds and a dual action buff and polish cleansing cloth. There’s quite a lot to say about this Cleansing System, so I had better get on with it! First of all, the cloth and the seeds aren’t just little ‘extras’ that have been chucked in with the main product to justify a bit of extra cost; they really are effective and beneficial additions to the cleansing balm. The dual action cloth is more of a ‘posh flannel’ than your usual muslin face cloth; it has a luxuriously soft side that’s great for pressing over your eyes to help remove mascara, or for sensitive areas of your face, and it has a slightly more abrasive side that makes quick work of taking off makeup and leaving skin with a ‘polished’ finish. The rosehip seeds, when added to the cleansing balm, make an astonishingly effective exfoliant – they are very, very fine, and you only need a tiny sprinkling of them to treat the whole face. The Moringa Cleansing Balm is truly a joy to use; it smells incredible and I find that it’s really a soothing and relaxing experience massaging it in. It’s really silky and smooth to apply, and you only need a tiny bit warmed in the palms of your hands and pressed over the skin. I have been using it on my lashes and lids, too and haven’t experienced any stinging or irritation, which means a great big thumbs-up for gentleness! You can use this balm for a quick cleanse, massaging it in and then removing with the dual action cloth; you can use it as an exfoliant with the seeds mixed in (avoid the eye area with those seeds! ), and you can leave it on whilst you soak in the tub so that it acts as a moisturising mask. I have found that the cleansing balm leaves my skin so moisturised that I don’t really need to use a face cream afterwards! For this reason, I can imagine that it would be slightly too heavy for anyone with extremely oily skin; although the formula is said to purify the skin and minimise open pores, it’s still packed full of extracts to combat dry, dehydrated skins! It would perhaps be worth trying to obtain a sample before buying if you do suffer from oiliness, but then I’d recommend trying a sample of anything before buying if you possibly can! You may have noticed that the cleansing balm is labelled ‘lift and sculpt’. 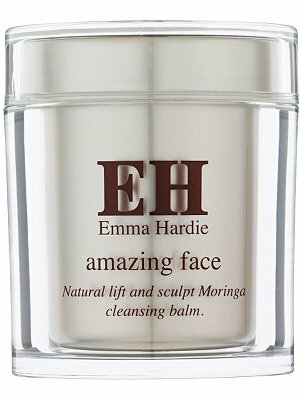 This is because Emma Hardie (top facialist and general skin guru) has devised a unique technique to lift and firm the muscles in your face – and you can do it yourself! Now I have to admit here that I’m not that great at following instructions when I’m in the bath. Firstly, the paper that the instructions are written on always gets wet, and secondly, I have my baths so piping hot that my brain almost entirely ceases to function. Despite these setbacks, I have managed a few little EH facial techniques, including the one where you have to stretch your neck up and open your mouth as wide as possible. (That took some explaining!) There’s also quite a simple technique where you pinch along your cheekbones and brow bone – I managed that one without too much fuss. I do think that if you’re massaging your face anyway, then you may as well incorporate some of Emma’s little tricks – every little helps! This is a blinding product (not literally!) that I can’t quite believe I haven’t used earlier. We all know that I’m a fan of the old ‘Cleanse and Polish’, but the Moringa is an entirely different experience. The balm melts down into something that’s not dissimilar to a massage oil, which makes it (for me at least!) more of a twice-weekly treat and less of a daily cleansing ritual. It does clean skin thoroughly-yet-gently, and it does leave it looking revived and radiant, and maybe as my skin ages and becomes drier then I’ll step up the frequency a little with it! If you do already have dry, dehydrated skin, then this luxurious balm might just change your entire skin regime! Make sure you go for this kit the first time around, rather than a single pot of balm, because I do think that the seeds and cloth are important parts of the system – you can also buy the cleansing cloth separately – a pack of three cloths costs around £10. 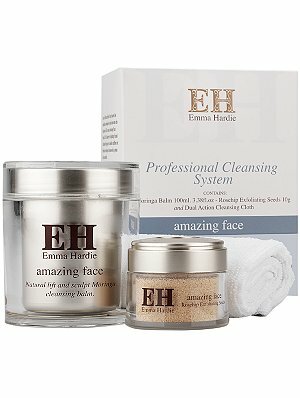 The Cleansing System costs £42 with free worldwide delivery at FeelUnique.com – includes balm, exfoliant and cloth!